Defense Minister Avigdor Liberman (Yisrael Beytenu) reacted to the military tribunal's conviction Wednesday afternoon of Sgt. Elor Azarya for killing a terrorist and behavior unbecoming a soldier. 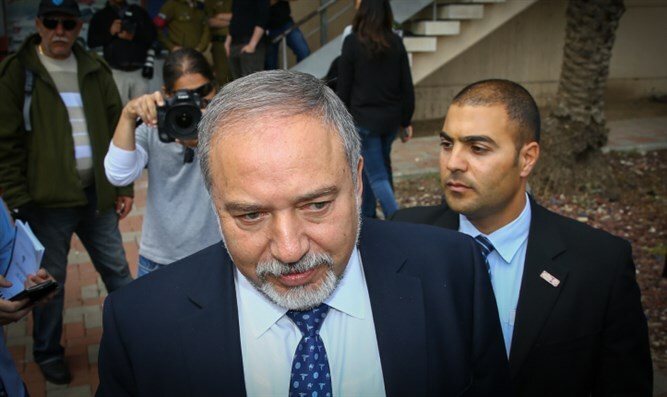 "This is a harsh verdict," Liberman said, ''The first thing I ask is for everyone - those who like the judgment more, and those like me who like the verdict much less - we are all committed to respect the legal decision and to exercise restraint despite the harsh verdict". Liberman promised that the defense apparatus would help the soldier and his family in every way possible. "I call on public figures to stop attacking the defense system, the army, and the Chief of Staff. The calls that I heard in last half hour are fundamentally wrong. The Chief of Staff is the commander of the army, day and night, 24 hours a day, seven days a week''. The Defense Minister called to remove the military from political debates. "One should study the ruling, take some air, and count to three before everyone charges the microphones and each person express his opinion." "Even those who like the decision less, and I was one of them - we all have to accept and respect the decision. The IDF must come out of this stronger, and not allow internal political debate in Israeli society to weaken the army," said Liberman. Earlier, Education Minister and Jewish Home chairman Naftali Bennett slammed the ruling in a Facebook comment, calling for an immediate pardon. "Immediate amnesty for Elor Azariya. Now. Today a soldier who killed a murderous terrorist who tried to slaughter [another] soldier, was convicted and put in handcuffs like the worst criminal,” wrote Bennett.